Now you can enjoy your two favorite pool games, volleyball and basketball. Both volleyball and basketball games feature rugged construction that will hold up to slam dunks and vicious spikes. 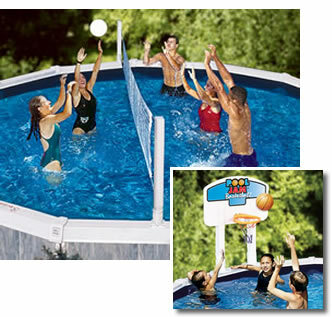 Both games attach to your pool's top rail by our patent-pending breakaway bracket. Both games come complete with realistic game balls. Installation is quick and easy.